Having fun and loving life! We have started some new adventures at our house: making more food from scratch. I blame Joshua. He looked at what we were spending on bread each week, and said we might be able to save some money if I made it myself. I mulled the idea around for awhile, then finally decided to jump in and see if it was possible. One day while I Pinterest, I did a search for homemade bread. There were actually quite a lot of recipes that popped up. I found one from the Oregon Cottage that seemed simple enough. The recipe anticipated using a dough hook in an electric mixer, and it didn’t look like it would take all day rise. We headed to Winco to grab some flour and yeast. I already had some honey, so that was no problem. Armed with the ingredients, I set out to make my first batch of homemade bread. I had no idea what to expect as I started cooking. The only homemade bread I had ever eaten was Grandma Becker’s homemade bread, but I’d never been around when she baked it. The only thing I knew about baking bread was there was something about letting the dough rise and kneading. The recipe had simple pictures to follow. Still, it was not easy when I didn’t know what I was doing. I had the yeast/water sit for the 15 minutes to create the sponge, and that seemed to rise pretty well. I was feeling pretty confident as I added the honey, oil, and more flour. And then I turned on the mixer. Flour flew everywhere as I started mixing the dough! Luckily it was just a little bit, so I just let my dough keep kneading in the mixer. After the dough was done kneading, I didn’t need to use a rolling pin to flatten the dough- just some clean hands and arm strength. Again, I was feeling confident as I made my loafs and set them in the pan to rise – but they didn’t rise. 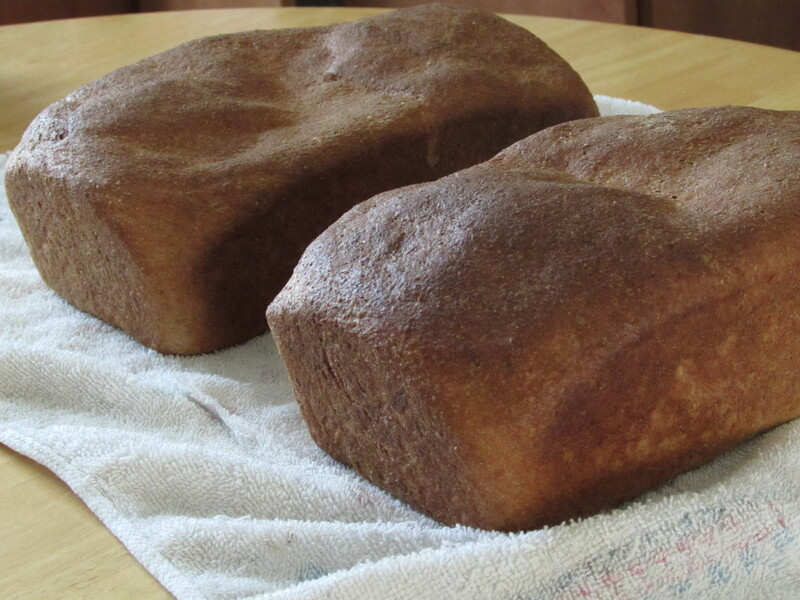 The recipe said to wait until they were about 1 to 1 ½ inches above the rim of the loaf pan. Her’s had taken about 45 minutes. I waited for an hour and half, and it still wasn’t even a half inch above the rim. One seemed to be rising, but the other didn’t. I realized I must have done something wrong, so I went ahead and put them into the oven. Again, faithful to the recipe, I turned the loaf pans when I was supposed to and cooked each pan the amount it said. What emerged was something a lot flatter and darker than I was prepared for. I realized that my dark loaf pans absorbed more heat and had cooked my bread faster than I had anticipated. I pulled the loaves out and waited for them to cool. They didn’t look what I had expected, but how would they taste? After they had cooled a little, I cut small slice and put some butter on it. The taste was excellent! I felt like I was a little girl again, eating some of the homemade bread that Mom brought home after visiting Grandma. And my children didn’t care how they looked – they just cared about the taste! Since that first attempt, I have made this recipe several times. I haven’t bought any bread for at least the past two months. I’ve also learned a couple trips that have helped the bread get better with each batch. Put the flour in one cup at a time. I started putting the flour in one cup at a time instead of all at once when I use the mixer. Since I’ve done this, the flour has stayed in the bowl and not gone all over the counter. Gluten helps bread rise. The recipe had called vital wheat gluten, and I completely ignored that the first time. I have since added the gluten with each batch and have gotten the bread to finally rise! Don’t use the top of the stove to have the bread rise. I had tried having the bread sit on the top of the stove. One loaf would rise, the other would not. Let the bread rise in the microwave. I actually found this trick in a comment section. Heat a cup of water in your microwave for about 1 ½ minutes, then put your loaf pans in the microwave to rise. This is what has finally given my bread the rise I was looking for on the first batch. Darker pans will cook faster. I reduced the time from the 15 minutes to between 10 – 13 minutes per side, and the loaves haven’t come out as dark brown. Butter the top before letting it rise. My aunt informed me that buttering the top with a pastry brush will stop the top from getting burnt or too dark. I try to do it before letting the bread rise, that way I’m not pushing down on the loaf. When the loaves are 1 – 1 ½ inches above the rim, put them in the oven! With all I’ve learned, I’ve finally gotten the rise I want out of my bread. But it sometimes comes a lot quicker than I anticipated, sometimes as soon as a half hour. I’ve found if I still wait 45 – 60 minutes, the bread stays risen, but flattens very quickly once I put it in the oven (as seen above). I have tried only one other bread – an Irish soda bread that I made for St. Patricks Day. Making bread at home isn’t as bad I thought it would be. If you can clear a couple hours, you can make a nice, homemade loaf of healthy goodness in your very own kitchen! So be adventurous, look for a bread recipe you want to try, and get cookin’! Copyright 2016 - FLM. All Rights Reserved.